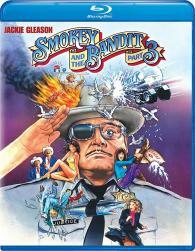 The good ol' boys of high speed hi-jinks are back in their third and final Smokey and the Bandit adventure. Starring Jackie Gleason, Paul Williams, Jerry Reed and Pat McCormick reprising their original sidesplitting roles.Sheriff Buford T. Justice (Gleason) is ready to retire when the notorious Enises (Williams and McCormick) challenge both him and The Snowman (Reed) to make a special delivery from Miami to Texas in 24 hours.To nab the $250,000 prize, everyone's out to beat the next guy to the finish line- with no holds barred! It's a wild free-for-all featuring some of the most incredible action driving stunts ever filmed, produced by Mort Engelberg, who brought the first two Smokeys to the screen.